Indian weddings are known for their grander and opulence. The bride comes across as a picture of beauty and grace. Am sure that all the guests appreciate the way she is looking and some of them might even be aware of how much preparation goes into being an ‘Indian bride’. Right from trying a thousand outfits, to finding just the right jewelry to getting all the pre-bridal tips from the best in the field, she has a lot of efforts to make to look her radiant best. The top knot is essentially a glamorous hairstyle that suits a contemporary Indian bride because it is very convenient and easy to place the pallu over. Brides willing to experiment can leave your hair open on the day of your engagement ceremony. Braids have been the traditional Indian hairstyles since centuries! Instead of braiding the hair neatly, you can try a loose and messy braid for a more natural look. The braided bun is an ancient bridal hairstyle that looks fashionable even today. If you have really long and thick hair, you can first twist it into a bun and then braid the rest of the loose hair. 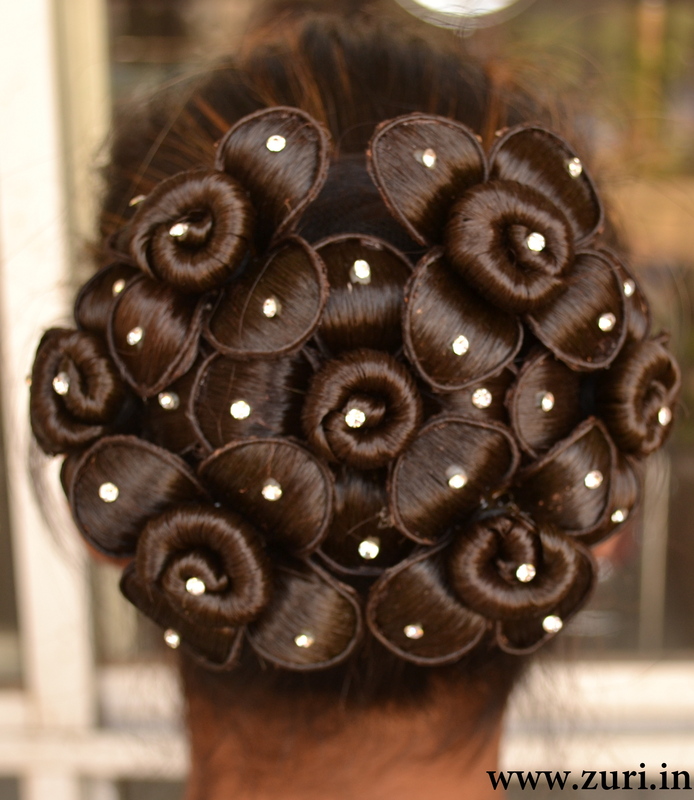 A bun is a very common hairstyle that can be innovated in many ways. You can try different types of bun hairstyles but they would all look bare without real flowers or matching hair accessories. Can You please tell the name of the hairstyle in 6th image. I want to try out that one.